If you thought Drive was an action movie that takes you on fantastic car chases and glorifies muscle cars, stay home and rent Gone in 60 Seconds or The French Connection. Drive is a very violent, dark film with no happy ending. 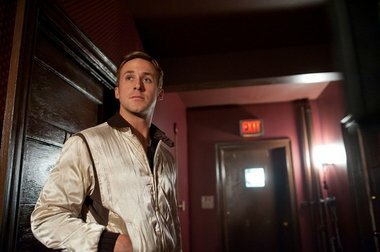 Ryan Gosling is a man of few words in Drive. He is the living embodiment of moral relativism. He’s a man defined by what he does – he drives. Whether as the get-away man for a robbery or the nice mechanic giving his neighbor Irene (Carey Mulligan) a ride home, it’s who he is and what he does. Ryan Gosling is the Driver in Drive. We never learn his name. He’s called “the driver” or “the kid” — a name would make it too personal. But his name really doesn’t matter because he only exists as a shadowy meta-hero, a sociopath who can be tender and loving in one moment and a ruthless killer the next [wait for the elevator scene]. He knows no difference between right and wrong or good and evil – it’s all relative. “Are sharks always bad?” he asks Irene’s young son, Benicio (Kaden Leos) while watching a shark show on TV. The little boy isn’t confused about good and bad and he answers “yes.” You know, the shark always ends up killing to survive. It’s in its nature. It won’t take you long to figure out that Mr. Gosling’s character is a shark. The City of Los Angeles and the seedy, decaying San Fernando Valley suburb of Reseda are the organic landscapes for Drive. The City couldn’t be more dark in its latest role as a violent city filled with crime and corruption, devoid of morality. Such is the role Los Angeles has played in countless “Film Noir” movies from1944’s Double Indemnity (Fred MacMurray and Barbara Stanwyck) to 1997’s L.A. Confidential (Kevin Spacey, Russell Crowe and Kim Basinger). Bryan Cranston plays Shannon, Gosling's mechanic boss in Drive. Every detail in this beautifully shot, edited and directed film has a meaning. 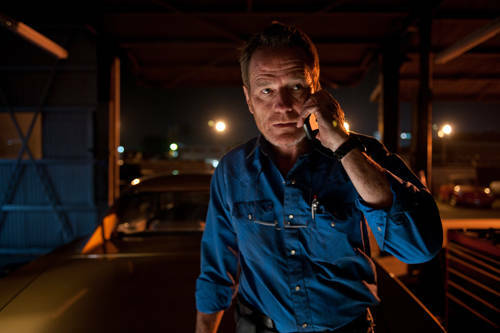 For example, as the film opens, Shannon (Bryan Cranston), the Driver’s repair shop boss, prepares a “driver” car for a driving “job” that night. Shannon states that the late model silver Chevy Impala is the most popular car in California and “no one will notice you” in it. I’m not so sure the Chevy Impala is the most popular car in California, but I do know that it’s consistently in the top 10 because it’s the darling of the corporate and rental fleets. It’s the perfect metaphor for anonymity in car-crazy Los Angeles. No one buys an Impala, you rent it at the airport. And sure enough, true to Shannon’s promise, the car and its driver gets lost in the throngs of people and cars at the LA Convention Center parking lot after a Lakers game. You can't quite see the apartment number in this picture, but it number 405. But I think I found the small detail that the filmmakers probably had some fun with (at least with a wink and a nod). You have to live in or be very familiar with LA to get it. Mr. Gosling’s character lives in a non-descript apartment building in Echo Park with an unlikely fantastic view of Downtown LA. His apartment number is 405. In LA, the 405 freeway is a living, eternal hell every day of every week of every month of every year. We learn that the Driver has moved into this apartment shortly before his life becomes a living hell.